Ok, so the "Maths at" timeline is a mess. The Christmas episode was recorded in November. The Christmas episode reveals secrets from later on in the series. We tried to hide these secrets in the Mean Girls episode, which was recorded around seventh, but released first. When we I say that we've had a complaint about Liz's language it from the pi day episode, not the Mean Girls episode. Is that all clear? And this is all because the recording quality of this episode is a little dodgy! Sorry about all that. Just pretend that Thomas, Ben and Liz are Time Lords. Anyway, we had to get there eventually. Probably number one of many science film lists: A Beautiful Mind. The biopic of John Nash, a prodigy behind the field of game theory. then don't ask us, we're all about the theory! 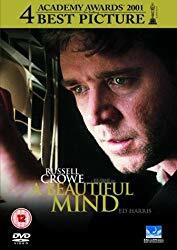 If you're interested in watching A Beautiful Mind you can follow the Amazon link below.